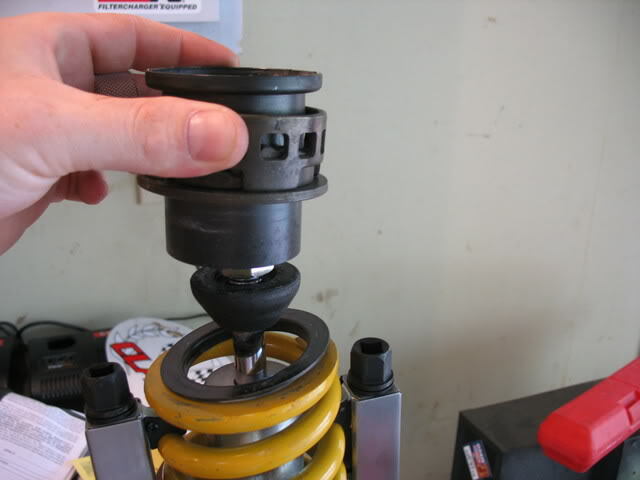 This is a "how to" change out your rear shock spring on an F4i, although I think most any CBR shock is about the same. 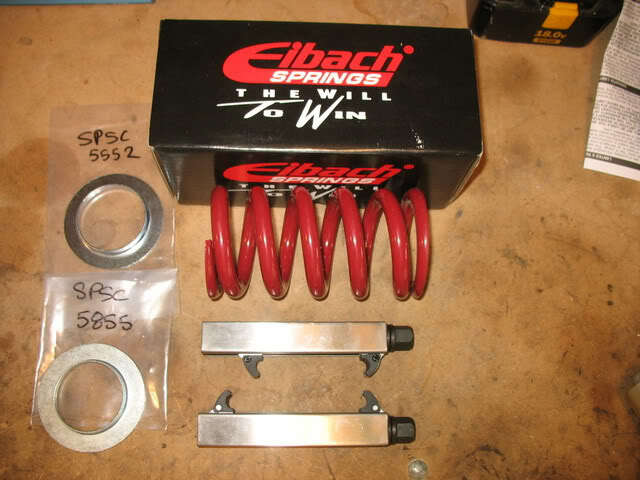 The stock spring on an F4i is rated for about 150lb rider, and I weigh in about 185lb with no gear.For some reason,I could not find a lot of information, or readily available upgrade kits. After doing some research I was able to find the parts, here is the discussion with part numbers and such. https://cbrforum.com/m_519142/mpage_1/key_/tm.htm.What I did found out was that you do need the new collars from race tech because the honda springs are tapered, and Eibachs are not. The collars areonly a couple of dollars a piece, so be sure to order those too. 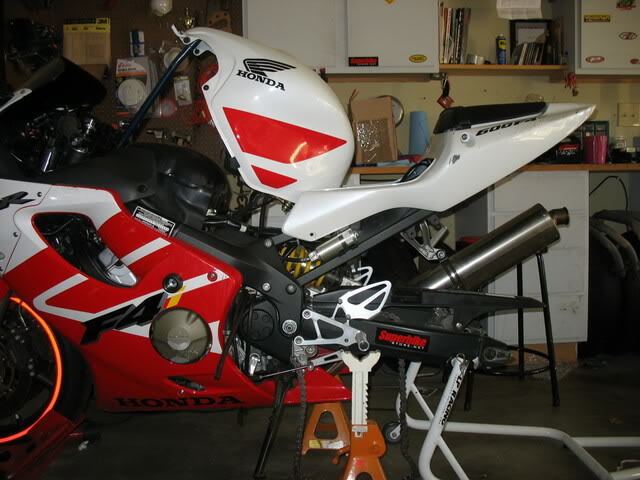 You will also need a way to get the weight off the rear swing arm so you can remove the shock. I have solid rearsets, so I just used jackstands to hold the bike up by the rearsets. Here is the bike prepped for removal of the spring. 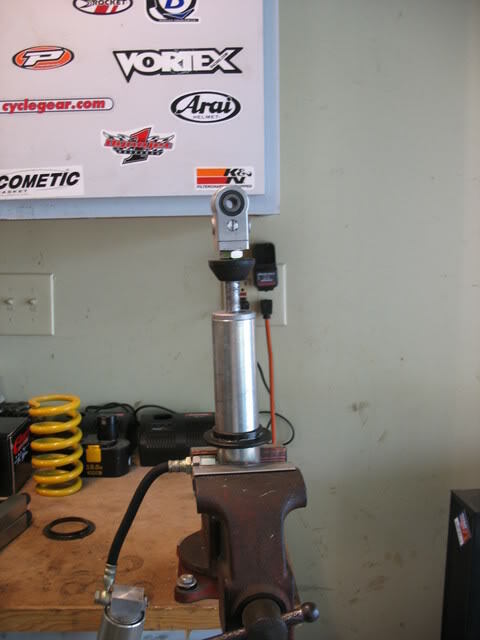 Next, load the shock up into a vise, with the remote resovior end facing down. Then usea spring compressor to compress the spring; be sure to use caution during this step. 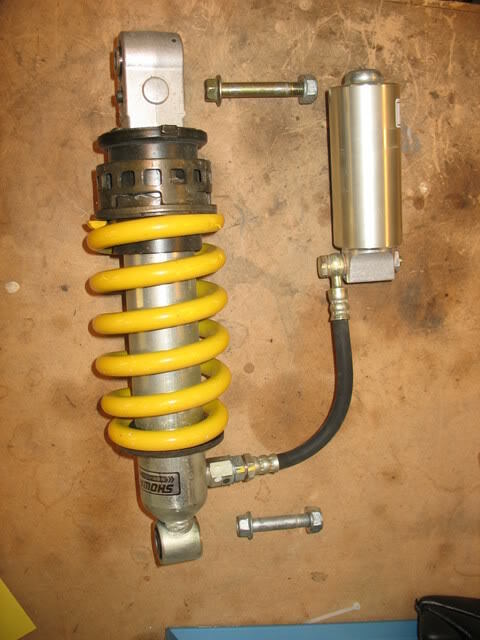 A compressed spring always makes me very nervous. I try to never reach over the top of the spring, or put my face anywhere near it. I may be over cautious, but I still have all 10 fingers so far. 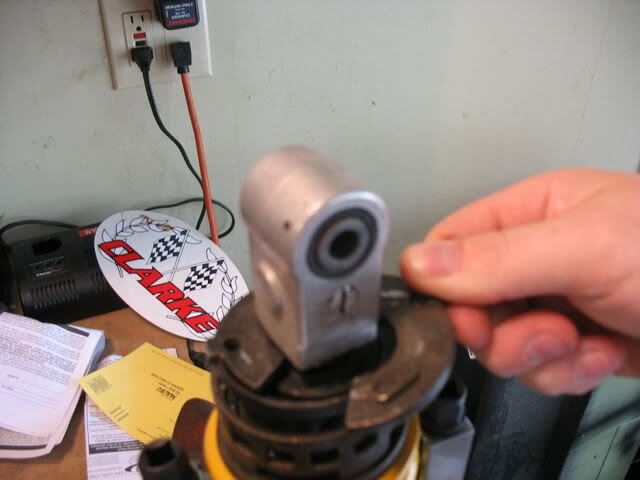 Once you have the spring compressed far enough, you will be able to remove "plates". I am not sure what they are really called, but they sit on top of the preload adjuster, and are just held in by the pressure of the spring. Mine were stuck in there pretty good, so a couple of light taps with a screwdriver unseated them. again, LIGHT taps, the spring is still under pressure, and you dont want that thing "springing"
also, you should keep that remote resovoir supported, do not let itjust hang like it is in this picture. Assembly is exactly the reverse of this. take note that the new spring collars are 2 different sizes, be sure to put the correct one on the bottom. It has a slightly larger inner diameter to fit over the factory spring holder that you left on the shock. The bolts that hold the shock need to both be torqued to 33ft lbs per the manual. I just did this last night, and I havent had a chance to set the sag and really test it out yet to tell how much of a difference it will make. 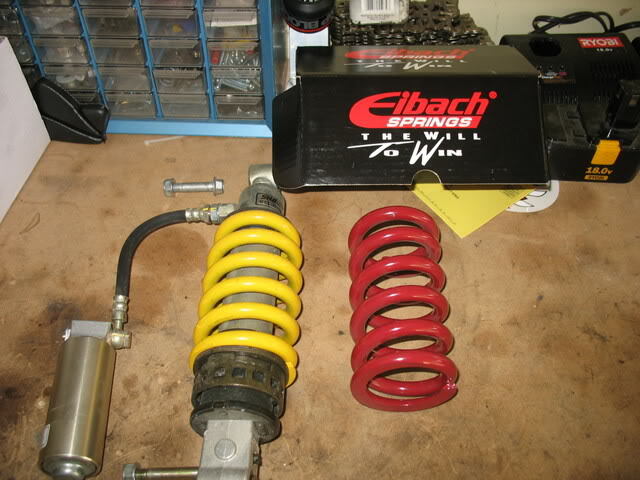 You can just increase the preload, and it will work just fine if your just commuting or casual twisties. thatswhat I have had it for a long time. But depending on your weight, and your riding style, you can be taking the spring out of its optimum working stroke. I had to crank the preloadway up to keep the sag correct, which limits your spring. Just like on the front forks, I had to change out to Ohlins .90 springsto set the sag correctly within the 1/3rd of the springs operating range to achieve the maximum out of the stock internals. So what did you have the stock spring set at to compsensate before? I have an '01 F4i and weigh about 180 as well. I am also a very new rider and probably won't be pushing the machine near any limits anytime soon so perhaps it's better I leave it at default. Great write up krash, exactly what i needed, i might be going for a full shock change though. Approx. how long did this whole process take? Osino, I had the stock setting at like 6.
but seriously, prep the bike, to take shock out, replace the spring and put it back in the bike, less than 2hrs. F4 rear spring on F3?